The US National Institute of Standards and Technology (NIST) and its partners in the US Nanoelectronic Computing Research (nCORE) consortium have awarded $10.3 million over four years to establish a spintronics research center in Mineesota. The Center for Spintronic Materials in Advanced Information Technologies (SMART) will be led by and housed at the University of Minnesota Twin Cities and will include researchers from the Massachusetts Institute of Technology, Pennsylvania State University, Georgetown University and the University of Maryland. Xiaoshan Xu, assistant physics and astronomy professor at the University of Nebraska-Lincoln (UNL), was awarded with $750,000 from the US Department of Energy (DoE) to advance his spintronics research. The main target of Prof. Xu's research is to investigate how organic spintronics works, and hopefully advance organic spintronics materials and devices. Spintronics developed NVE Corporation reported its financial results for Q1 2017. Revenues reached $6.85 million (up 12% from Q1 2016), due to 23% increase in product sales (offset by 49% decrease in contract R&D revenues). net income increased 16% to $3.03 million. NVE recently introduced three new and improved products; a low-field angle sensor, a new spintronics mangetometer sensor (which is the world's smallest high-performance integrated circuit analog sensor) and the world's smallest high performance isolated network transceiver. The Johannes Gutenberg University Mainz (JGU), with funding from the German Research Foundation (DFG), is setting up an Emmy Noether independent junior research group to study spintronics. 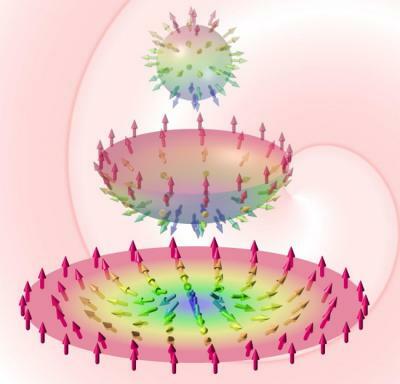 Specifically, the TWIST (Topological Whirls in SpinTronics) work group will study skyrmions - magnetic "particles" or nodes within a magnetic texture. Skyrmions are more stable than other magnetic structures and react particularly readily to spin currents - which makes them interesting for spintronics applications. The UK's Engineering and Physical Sciences Research Council is funding a £2.7 million spintronics project led by the University of Cambridge. The aim of the project is to develop prototype superconducting spintronics devices for power-efficient supercomputing applications. This work continues from the discovery of spin polarized supercurrents in 2010 at the University of Cambridge, as well as recent research that shows it is possible to power spintronic devices with a superconductor. The Singapore's National Research Foundation (NRF) announced a new S$5 million ($3.7 million USD) fund to support Spintronics industry collaborations with research institutes in Singapore. Last year the National University of Singapore together with Nanyang Technological University launched a new consortium (the Singapore Spintronics Consortium, or SG-SPIN), with an aim to encourage collaborative research partnerships between industry and the academia. The new $3.7 million fund will support existing and new SG-SPIN projects. The Graphene Flagship announced a €350,000 work package that explores the potential of graphene spintronics for future devices and applications. The GF is searching for a new partner company to support device development and commercialisation of graphene spintronics, by applying it in specific device architectures dedicated to commercially viable applications and determining the required figures of merits. The project's budget is for the period 1 April 2016 – 31 March 2018, and includes devices which require optimized (long distance) spin transport, spin-based sensors, and new integrated two-dimensional spin valve architectures. The Graphene Flagship expects that at the start of the Horizon 2020 phase (April 2016), spin injection and spin transport in graphene and related materials will have been characterised and the resulting functional properties will have been understood and modeled. The National Science Foundation (NSF) awarded a $500,000 CAREER Award grant for Dr. Claudia Mewes from the towards her spintronics research. The CAREER Award is the NSF’s most prestigious recognition of top-performing young scientists. Dr. Claudia's research will combine different theories to close the gap between materials design and device performance with the ultimate goal of finding materials that work best in those environments. Dr. Claudia's research includes an educational outreach component looking to increase the number of young girls interested in pursuing careers in science. The European Research Council (ERC) granted a six-year €9.7 million grant to professor Jairo Sinova from Johannes Gutenberg University Mainz (JGU) for its spintronics research. Professor Sinova will collaborate with researchers from the UK and the Czech Republic. The project is titled "Spin-charge conversion and spin caloritronics at hybrid organic-inorganic interfaces". The researchers hopes that by combining principles of inorganic spintronics with organic materials (polymers) they will achieve better results than if they used purely inorganic systems. The advantages of using polymers include the flexibility of the material, control over the physical properties, and the fact that they are relatively easy to produce. Two German universities (Johannes Gutenberg University Mainz - JGU, and the University of Kaiserslautern) are collaborating on two Spintronics commercialization research projects (with a combined budget of €3.8 million). The first project is the establishment of STeP (Spintronic Technology Platform) in Rhineland-Palatinate, which is designed to boost magnetic coating systems R&D. The main focus of the STeP research is into Heusler materials. This new collaboration means that academic research is being immediately transferred onto an industrial production line.